* The Rm450.00/month allowance for the Tuai Rumah is suggested to be doubled to Rm800.00/month next year! Penans bring loggers to court! Ba Jawi (Sarawak), MALAYSIA. The Penan community of Ba Jawi in Sarawak’s Upper Baram region has today lodged a collective action lawsuit against Malaysian timber giant Samling and the state government of Sarawak over 15,000 hectares of primary rainforest in order to protect their livelihood from being destroyed by logging. You can shut down a web site some of the time-but not all the time! The truth can't be avoided for too long! The nameless foreigner who become the consort of Sarawak's CM will be the subject of much talk for months to come so long that she is covered by a veil of secrecy. TV Sarawak Bebas DVDs welcome on-line orders! 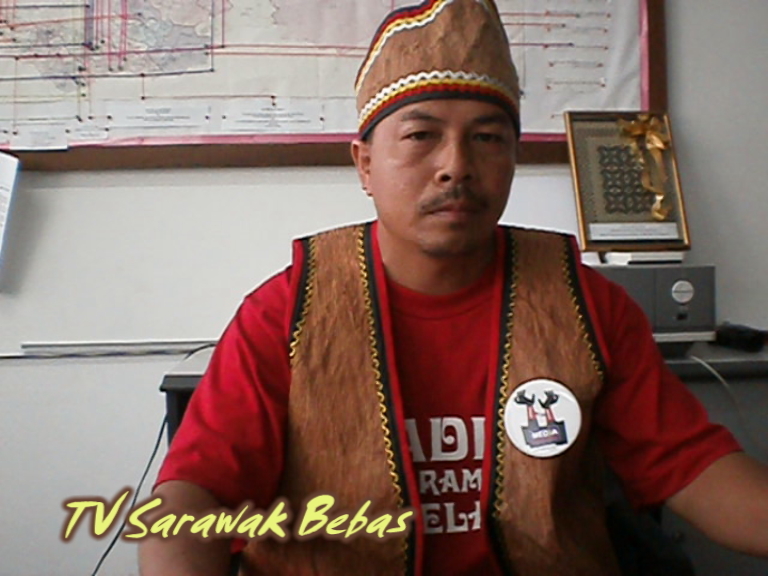 TV Sarawak Bebas: What is it? TVSB has started this year as a DVD/CD based media to target the vast interior of Sarawak. The content give coverage to urgent/relevant issues in the interior eg land rights struggles, lack of birth certificate,IC, voting rights, lack of basic amenities etc. The aim is to share the information, promote discussion and finding of collective solutions among the interior folks, who have been largely segregated by unmanageable distances between the communities as well as bad/absence of means of transport. Press statement by Sarawak Report: we are under attack by the very rich! Sarawak Report has been subjected to a cyber-attack, which has knocked it temporarily off-line. This follows a number of death threats sent through our mail, which have been notable for their creepy, ‘black-magic’ format. Disabling websites by using millions of hits is a very expensive process, even more expensive than hiring top lawyers. So this limits our list of suspects in this case to people who are both very rich and have a direct interest in shutting us up, but who would rather not face the scrutiny of an open court. 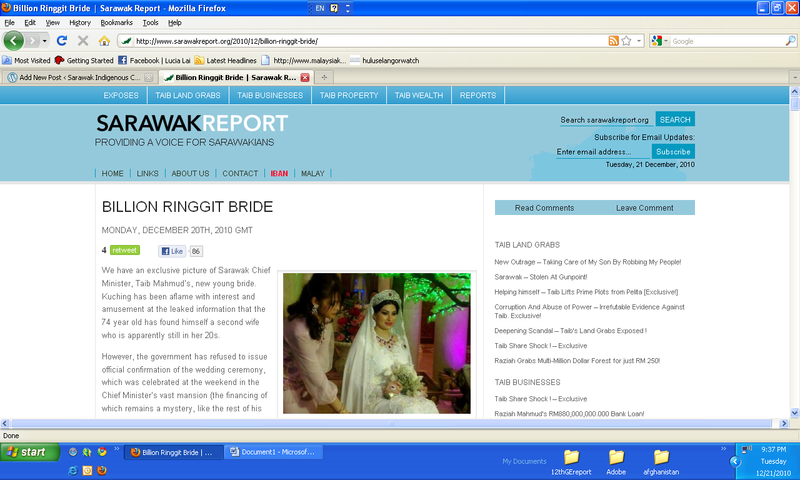 We have an exclusive picture of Sarawak Chief Minister, Taib Mahmud’s, new young bride. Kuching has been aflame with interest and amusement at the leaked information that the 74 year old has found himself a second wife who is apparently still in her 20s. However, the government has refused to issue official confirmation of the wedding ceremony, which was celebrated at the weekend in the Chief Minister’s vast mansion (the financing of which remains a mystery, like the rest of his properties). Even senior Government Ministers have been scouring the web for details of the new “Thief Lady”, who has yet even to be announced by name. In desperation calls were even going out to Sarawak Report. We feel honoured to oblige. Sarawakians will not fail to notice that several thousand hectares of irreplaceable jungle must have been felled and turned to oil palm to adorn this lady’s neck.